The upcoming Mobile World Congress trade show in Barcelona will see a lot of smartphone vendors launch new devices, with the likes of Samsung, Nokia, Moto, Sony, Xiaomi and others expected to launch their next-gen flagships at the event. Now, Taiwanese tech company Asus has sent out media invites for its MWC press conference that will start at 7.30PM CET on February 27. For those in India, this means the event will start exactly at midnight IST on the 28th of February. While the company hasn’t officially stated which exact devices it plans to announce on that day, it has given strong hints about its fifth-gen ZenFone lineup. 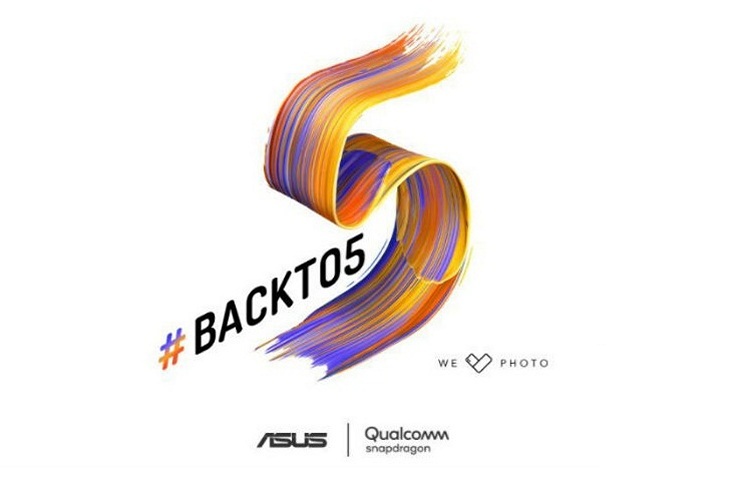 As can be seen from the accompanying image, the invite comes with a “#BACKTO5” hashtag in what seems to be a clear tongue-in-cheek reference to the first-gen ‘ZenFone 5’ that was launched exactly four years ago, when the company kicked off its smartphone business by announcing three Intel-powered handsets named the ZenFone 4, ZenFone 5 and ZenFone 6 at the CES 2014 tech show in Las Vegas, Nevada. Since then, however, the company has stuck to ARM processors for the most part, with Qualcomm SoCs powering almost all of its high to upper-mid-range devices. It’s likely to be no different this year, as the invite itself sports a Qualcomm logo, so it’s a safe bet to say that the next-gen Asus flagship will be powered by a Qualcomm chip. Meanwhile, the invite also has a “We Love Photo” motif which leads you to believe that the device(s) will come with photo-centric hardware and software, although what exactly that entails, remains to be seen. Either way, the company may very well announce multiple devices at the upcoming event. An Asus handset with model number ASUS_X00QD received a certification from the Wi-Fi Alliance last week, although, if reports are to be believed, that’s only likely to be a mid-ranger called the ZenFone 5 Max. Asus is also said to working on the ZenFone 5 Lite that recently received a certification in Russia, so it will be interesting to see if any of those devices are announced alongside the expected flagship at the event.